Greta Christina's Blog: "Its offspring made small mewling sounds": Edward Gorey's "The Trouble With Tribbles"
"Its offspring made small mewling sounds": Edward Gorey's "The Trouble With Tribbles"
This made me laugh harder than anything else all week. It's a... I don't even know how to say what it is. 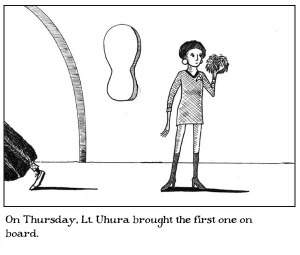 Shaenon K. Garrity, a fan of Edward Gorey and Star Trek, discovered that the former had been a fan of the latter, and created this imagining -- essentially a fanfic mash-up in comic form -- of what Gorey would have done with "The Trouble With Tribbles." The drawing doesn't quite have Gorey's touch (who does? ), but it's pretty darned good, with some very Gorey-esque compositions -- and the writing is dead-on. Absolutely not to be missed. Note to the artist: Gorey was also a Buffy fan. Can we get a mash-up of "Band Candy" next? Please please please please please? Via Making Light, and also via my friend Rebecca. I've been a fan of Edward Gorey (or is that Ogdread Weary? Awdrey-Gore?) ever since I encountered his work in the late, great National Lampoon magazine. He always struck me as being a man who was born 100 years too late. His subject matter, art and writing would have fit right in in 1895, right along with "The Yellow Kid" or "Little Nemo in Dreamland".